The Engraving shows the falconer with his hawk on fist, ready to let her down the wind to hunt the wild duck or heron. This was the Wyn-monat, the wine-month of the Anglo-Saxons. There can be little doubt that many of the great monasteries in the south of England had their vineyards and made the wine for the use of their fraternities. Whilst they didn’t manufacture their wine for profit, the vineyard and wine press saved them the costs of expensive foreign wines, for their labour was of little account. Vineyards were found in many places in England and they are repeatedly mentioned in the Doomsday Book. It is interesting that there was a question over the ancient growth of the vine in England and this became the subject of a regular antiquarian passage-at-arms in 1771, when the Honourable Daines Barrington entered the lists to overthrow the chroniclers and antiquaries, from William of Malmesbury to Samuel Pegge, and to prove that the English grapes were currants- that the vineyards of the Doomsday Book and other ancient records were nothing but gardens- that the climate of England would never have permitted the ripening of grapes for wine. The throng of partisans to this battlefield was prodigious. Some records suggested that a change in the climate and the sloth of the people rendered the vineyards less and less profitable in every age until finally becoming extinct. This however is untrue. French wine was largely imported into England after the Norman Conquest and there are many records reporting the passion for French wines that the court and nobility had during the reign of Henry III. The monks continued to cultivate their wines- as in the sunny vale of beaulieu, where the abbey which King John founded, had its famous vineyard; but the greatest supply of wine- even to the diligent monks- was from the shores of France where it was cultivated under the commercial principle. Had the English under the rule of the Plantagenets persevered in the home cultivation of the vine for wine-making and tried to compete against the claret of a superior vine that was available within a few hours from across a narrow sea, England’s capital would have struggled fruitlessly against natural disadvantages and the people of England would, for the most part, have been denied the enjoyment of wine: the ports of Sandwich and Southampton made excellent, cheap wine available to them. Hence, the English vineyards were gradually changed into plain meadows and cornfields. Blot: Hengest (Festival of Settlement) commemorates the settling of our folk in all lands and hails the tribal groupings of our folk everywhere. We should be proud of our heritage and the bringing of law and order into the countries in which our folk settled and are reminded to look to the toil and bloodshed of our forebears as inspiration to ensure a future for our folk. We hail Odin and the warriors of our folk, the women and the builders who nurtured what was won and who gave life to succeeding generations and remember that they are still there, reaching out to give us courage, comfort and strength. We remember Hengist and Horsa, the founders of England and the White horse Stone on which they were laid as the strong, silent and sacred site that reminds us of the nation’s birth. Our gealdor is Ingwaz, representative of the Vanir god Ing, who many also see as being identical to Frey. He is a god of prosperity, peace and fruitfulness, an earth god whose very footprints bear fruit. Wherever our folk settled, their genius brought these qualities to the lands. As a solar God, we also see him as a representative of the solar cycle, which is the fulcrum around which life on earth orbits and as such, all cycles within life are connected to it. Cycles are the pattern of the life, death rebirth continuum and it is this very flux that creates and sustains life and which is the thread connecting all life and linking us with our ancestors and successors. Remembering October. This month is paradoxical by nature. It is a month in which the energy of early autumn can be felt, when there is a lot of bustling about and rearranging ready for the winter months ahead; yet, as it creeps towards November, a more reflective, soulful energy begins to envelope us. In the country, it is the time for stocking up the products of the harvest, whilst nuts and mushrooms are collected. Herbalists- and in times past, the wise mean and women- brew their strengthening potions and animals reared naturally are brought down to the pastures from the hillsides. October also holds an element of anxiety for some folk and this is quite natural, as the dying vegetation can remind us of our own frailty and mortality. Thus, it is a time for reflection and learning to withdraw a little from the outside world so that we can recharge ourselves. Physically, it is a good time for a mid-autumn cleanse, in order to strengthen the body for winter. Having adapted your diet on the run-up to autumn, you should be surviving the change well. This cleanse also helps give your mind the message to ‘let go’ of all that no longer serves you also ready for the next cycle. Concentrate on steamed vegetables, warmed fruit, soups and drinking plenty of boiled springwater, which according to Ayurveda, helps to dislodge mucus and toxins from the system. Support your body with vitamin supplements and herbs such as Echinacea to help strengthen the immune system. The Engraving shows the blazing hearth and the swine killing. This was the Wint-monat or wind-month of the Anglo-Saxons and the great slaughter rime. The days of fresh meat were nearly gone and the green feeds of the sheep and hogs was almost exhausted and so they were doomed to the salting-tubs. The Martinmas beef- the beef salted at the feast of St Martin- gave rise to the proverb: ‘His Martinmas will come, as it does to every hog’ speaks of a destiny as inevitable as the fate of the acorn-fed swine at the salting season. It was also the season when the labourers would heat and prepare their utensils, as can be seen by the man holding a pair of rough tongs in the fire. Meanwhile, others are warming their hands by it whilst another bears a bundle of fuel to supply the fire with fresh billets. Whilst this particular illustration is of the domestic hearth, another important job was that of the smith. There were specific names for all the different types of smith- ironsmiths, goldsmiths, coppersmiths etc- and anyone that struck with a hammer (including carpenters) were known as smiths. Anything, from a ploughshare to a needle and horseshoes, was produced by smiths; even the monks were smiths. Surnames such as Smith, Turner and Taylor derived from the families who worked in these occupations. There is little doubt that the mines were well worked in Saxon times and indeed, the Anglo-Saxons were exporters of goods made in gold and silver. Blot: Einheriar (Festival of Heroes) recognises the strangeness of November, in which a yearly Ragnarok occurs: Nature’s manifestations appear to have ‘died’ and the veils between the past, present and future seem to be especially thin- the dark and cold before the Ragnar rise of spring’s rebirth. Thus we recall especially our ancestors and all the folk who have died in battle defending with honour what they felt was right. We recognise the Einheriar- Odin’s elite warriors- as the epitomy of the warrior spirit and we hail them along with Odin as their father, the valkyries who bear the battle slain to Valhalla, Tyr and Heimdall. The hearth sword and banner are received and members of the hearth restate their loyalty and service to protect faith, folk, family and our holy religion from the force of spears and the powers of fate. We remember that peace and freedom have to be defended and thus, that sometimes this requires us to fight for it at the cost of personal comfort. We are also reminded that the land has been consecrated in the highest way possible by the blood of our ancestors and that the highest honour we can give them is to continue the work they initiated. We also remember those of our folk who are in a combat situation today. Our Gealdor is Ansuz and Berkana. Ansuz is the rune of the godforce, of Odin. Odin leads the wild hunt on Sleipnir, the eight-legged horse who perhaps also represents the pallbearers- with his two wolves and two ravens Hugin (memory) and Munin (the warner). 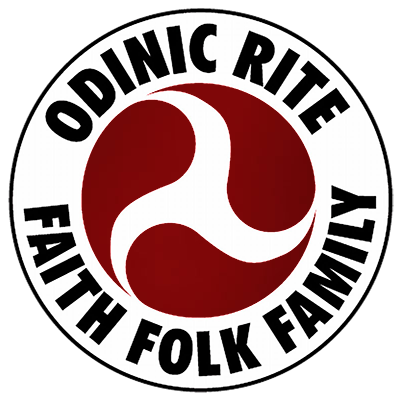 It is the godforce within the heart of all our folk- Odin- who which will protect and defend our folk by ensuring we remain vigilant to what is happening within and around us whilst also remembering our folk heritage that resides in our hearts and minds and upon our lands. It is this godforce, which will defend our peace and freedom. Berkana is the rune of the birch, symbolic of rebirth and the return of spring and brightness- of the Queen of the May. Thus, by always working from the godforce within, it is inevitable we shall be reborn at many levels: our spiritual selves will evolve into new cycles of being; our folk will thrive and once again, enjoy a new Golden Age and at the earthly level, whilst we have yet to endure the hardship of winter, the great wheel will turn and Spring will return to us. We are also reminded through this runic combination that the feminine must be defended so that those gifts of rebirth can flourish amongst our folk in all their manifestations- that bright Berkana will once again dance in our hearts and upon our lands- and return the joy, balance and hence wholeness to our folk that has been drowned out by the noxious anti-female stance of the desert creeds. Remembering November This can seem like a bleak month, particularly as nowadays it is generally obliterated by the commercial thrust towards the Yuletide celebrations; thus, it can become lost in the rush. However, our ancestors celebrated this time of year with the great fire festival of Samhain, which paid homage to the sun and whose fires guided and welcomed wanderers to the feast; for it was the end of the old year and the start of the new- a time for remembering the ancestors and for divining what the future might hold- a time for the spirits of ancestors, folk and successors to feast together. Thus, it is a period when we make our final preparations for winter and at all levels, start to turn inwards. Just as the fields are now stripped bare and laid fallow or containing seeds deep within, so too our emotions, minds and souls are opened and start to come to our attention. However, with the pressure to prepare for Yuletide and the shorter, bleaker days, a conflict between ‘life’ and the innate message of the season to slow down occurs and can precipitate problems with stress. And whilst stress is a necessity for life, over the long term and if unrelenting, it can result in depression, anxiety, palpitations, ulcers, headaches, menstrual cycle irregularity and even trigger allergic reactions. At the physical level, the diet should be fortifying and strengthening to help the body stave off winter illnesses such as flu; and of course a stronger body will be more resilient to stress and more able to buffer its effects. Hence, root vegetables are the natural seasonal produce which can form the basis of soups and stews and heavier foods such as meat and milk are tolerated well now, as this is the season for building and strengthening the body. Thus, it is natural to put on a little weight, which can easily be shed in spring; but beware of putting on too much. Maintain a good exercise programme, perhaps even trying something new that can be done at a gym and so avoiding the possibility of being thwarted by bad weather. Be mindful of stress and learn what ‘pushes your buttons’ so that you can find ways of combating it. Deep breathing exercises, yoga, meditation and autogenic training can all be helpful; but also recognise any long-term problems and if necessary, get help to solve them. And as the ‘season of the soul,’ it is also a good time to develop spiritual and psychic awareness further. The Engraving shows the threshing season. The flail has a reverend antiquity; the round sieve slowly did the winnowing whilst the farmer with the notched stick marked how many baskets of the winnowed corn were borne to his granary. This was Winter-monat, or winter month. The woodman would bring in the wood for the hearth fire and there would be jolly merrymaking during the festivities: harps and pipes would be played in the halls and there would be dancing. This was also called Heligh-monat or holy month. Blot: The Mother Night (Yule- the Midwinter Festival) celebrates the Winter Solstice: it is the end of one cycle and the start of a new one; the sun, having sunk to its lowest descent, now starts its ascent towards summer, apparently ‘reborn.’ Yule (from the old English hweol- wheel) encapsulates the twelve months in twelve nights; the cosmic spirit feels especially close as life, death and rebirth seem to merge and the cosmic and earthly elements are held in a concentrated essence. It is a night to hail the mothers and the gifts of rebirth. And we are reminded that just as the wheel turns through the seasons, so it also turns through the ages and thus, whilst we are in a dark age of ignorance and apparent decay, there will be a new springtime and a New Golden Age. Thus we must bravely face the cold and the dark and remember that in life is the paradox of opposites, light and dark, joy and sorrow, that all must be embraced. We are reminded of the evergreens that symbolise the eternity of life in the midst of the coldest times and of comradeship and hope. Thus, the sunwheel is lit along with the sacred fire and the latter is passed from the oldest to the youngest to symbolise the eternal unbroken chain of life, death and rebirth and hope of renewal. Our gealdor is Fehu. And whilst it brings a similar message to that of July, it emphasises the holy mystery of the greater cycles of all life, of Nature’s motherly care epitomised by the holy cow Audhumla who arose from the primeval ice to give life. She created Buri, the father of the Gods behind the flowing planetary life-stream, the life-giving power of all life throughout the universe. From Buri, we gain our awareness of the true unity of all life. Fehu is the first rune of the Futhark, the herald of life; and life is the inexorable flow of constant the constantly changing cycles and the heart of being. Remembering December Few people regard winter as their favourite season: days are short; the weather is bleak, the trees are bare and winter ailments seem rife. Quite simply, it is the season when nature withdraws into herself and we naturally become more contemplative: it is the midst of the season of the soul and to a large extent, our physicality takes a back seat as we are drawn to do more inner work- to consolidate the previous year and to look forward to the next. At the same time, we draw close to those folk who help us survive- most often our families; but they aren’t necessarily the ones we are most happy with and so Yule can be a time of great stress and conflict. Indeed, it bodes well to recognise this as an integral part of the season’s energy as the great cleansing tide once again starts to move in and bring with it rebirth from death. In some traditions, this has been symbolised by the battle between the oak king and the holly king, where the oak rules the waxing half of the year and the holly rules the waning half. Yet because we are inundated by media models of how we ‘should’ enjoy the season, we paradoxically worry about anything that moves: what we ‘should’ be doing and what we ‘shouldn’t’ be doing. It’s as though the inherent message of inevitable death and rebirth terrifies us and makes us into victims of circumstance. For at one level, the season is indeed about dissolution of the ego before rebirth and hence, it is natural we should find ourselves engulfed by conflicts that so often mirror our fear of ‘losing ourselves.’ However, with a careful, pragmatic and gentle approach, the new season can be ushered in more gently and without crisis management- as a birth should be! Hence, work out what you really want to do; accept those situations you can’t change and instead, relax about them; plan and prepare; don’t overspend; maintain reasonable expectations and make time for yourself to start thinking about the New Year ahead- without stressing about it! Physically, nourish yourself well with hearty seasonal produce and increase your vitamin and mineral intake. If you have nourished yourself well throughout the year, you will be in a good position to combat seasonal ailments. But if you are accosted by any, understand that this is an opportunity for your immune system to test out its defences and ease up a little on yourself to make a full recovery. Once more, we return to where we started on the year’s wheel- the rebirth of another New Year. However, it must be remembered that all endings and beginnings on the wheel are arbitrary points for our convenience; for life is a process of becoming all that we will be over cycles- moments and aeons alike. Thus, in every moment, there is a Ragnarok and a rebirth as we hone ourselves on the anvil of opposition and the cycles reflect this struggle: every season in Midgard contains the kernel of its opposite, which grows to engulf it and to in its turn, be swallowed back again. Indeed, there is no perfect and lasting state of being; all is flux. Thus, the pursuit of health is an unfolding process where aspects and layers of ourselves are uncovered for scrutiny at different times- a revealed knowledge that brings with it experienced knowing- the hidden treasures of the seasons. And as we cycle through the years, the form and depth of our lessons may change, but the essence of the seasons remains the same. Modern living has created a massive ‘wobble’ in the cycles and given the template that the seasonal cycles provide us with, it is easy to see the extent to which we have fallen out of sync- the result of which is dis-ease at a very deep and profound level of being. Conversely, health is about honouring this gods-given pattern that creates wholeness and in doing so, we align with- and thus honour- our gods and goddesses. Hence, working for health protects and nurtures the folk spirit, which, like a blazing need-fire, transforms our souls into a vibrant manifestation of Natural Law through the agency of the cyclical. Hail to all our Holy Gods and Goddesses. Re-membering the Wheel of the Year – Part 3 Another Site Reclaimed!